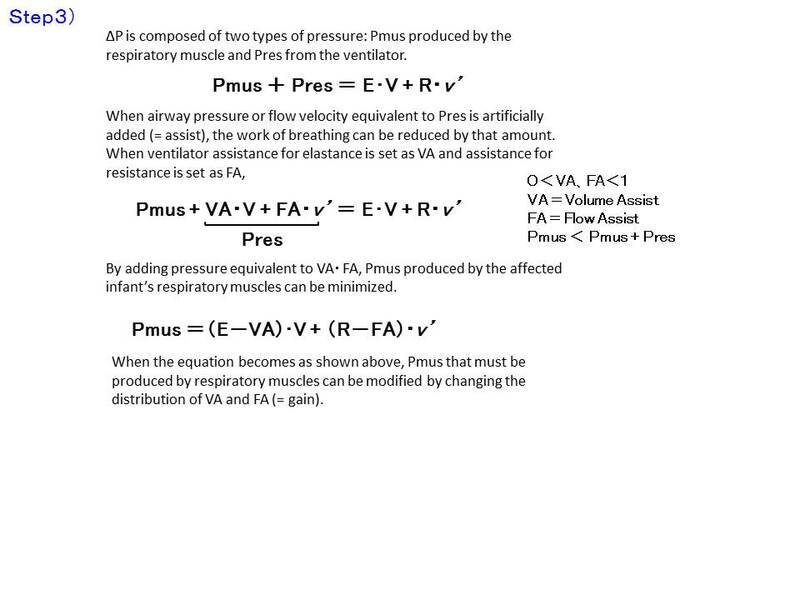 Following the basic edition, this article primarily explains the details of Proportional Assist Ventilation (PAV), the major feature of Stephanie. (4) Use it to the fullest! PAV is a new ventilation mode where airway pressure increases or decreases proportionately to the size of spontaneous respiration by respiratory muscles. 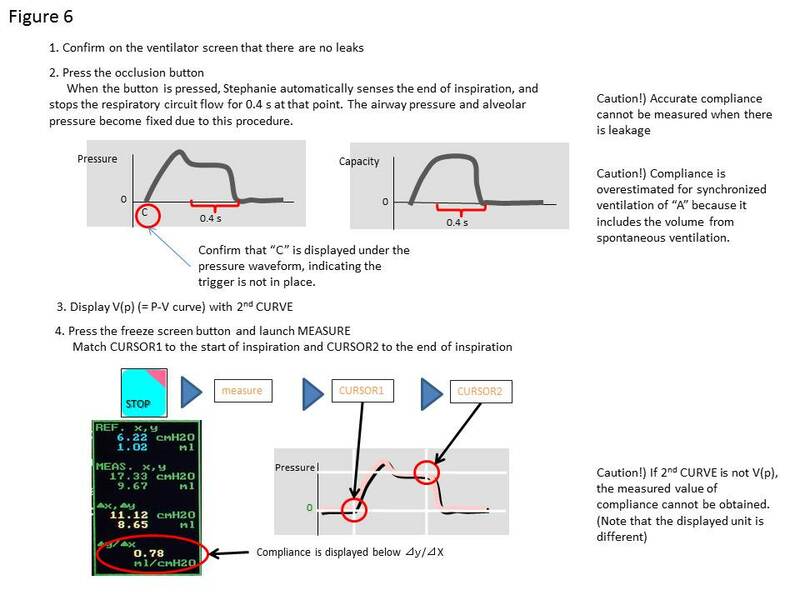 Unlike a conventional ventilator equipped with direct parameters such as inspiratory pressure, inspiratory time, or volume, the Stephanie ventilator relies completely on the patient also for inspiratory timing (Figure 1), and new parameters, Elastance (degree of elasticity) and Resistance (airway resistance), are used for its configuration. Several advantages can be anticipated including: less discomfort due to a more gradual increase of inspiratory flow velocity compared to typical pressure-controlled ventilation, a reduction in secondary lung disorders can be anticipated by decreasing the mean airway pressure compared to synchronized intermittent mandatory ventilation (SIMV) and Assisted/Controlled ventilation (A/C) , and smaller changes in the intrapleural pressure leading to less impact on circulation because the respiratory muscle is proportionally assisted. Moreover, although spontaneous respiration is required because the system depends completely on it, the system is also suited for preterm infants who are likely to develop apnea by using a combination of the superior backup ventilation described below. Pulmonary compliance (C) is an index of how much lung volume can be obtained for a given amount of pressure change. 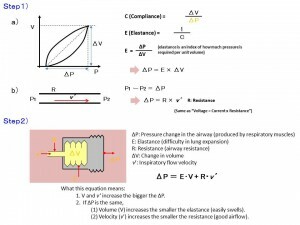 Elastance (E) is the reciprocal of this, and is an index of how much pressure (ΔP) is necessary to obtain a certain amount of lung volume. As an equation, the relationship, ΔP = E • ΔV, holds true. When air flows through a thin tube, a pressure gradient arises between the tube’s upstream and downstream due to tube resistance. 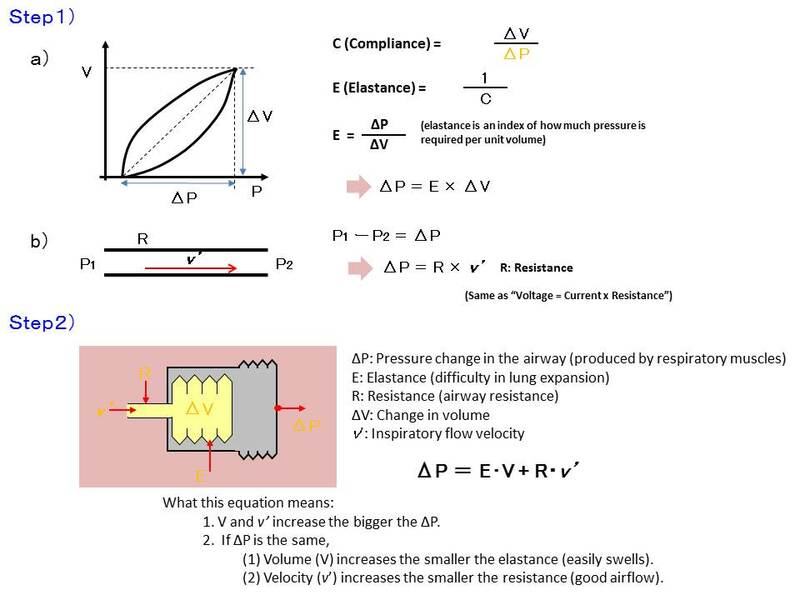 Here, this pressure gradient (ΔP) can be written as ΔP = R × v’ when the resistance of that tube is R and when the flow velocity is v’. Combining the two equations from Step 1, the relationship, ΔP = E • ΔV + R • v’, is established. This equation indicates that ΔV and v’ increases the greater the ΔP. Conversely, if ΔP is the same, volume increases the smaller the E (easily swells) and flow velocity increases the smaller the R (good airflow). 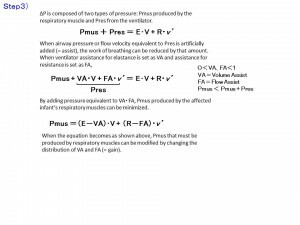 ΔP is composed of pressure produced by respiratory muscles (Pmus) and pressure due to ventilator (Pres). When airway pressure or flow velocity equivalent to Pres is artificially added (= assist), the work of breathing can be reduced by that amount. When ventilator assistance for elastance is set as VA (volume assist) and assistance for resistance is set as FA (flow assist), by adding pressure equivalent to VA•FA, Pmus produced by the affected infant’s respiratory muscles can be minimized. Therefore, Pmus that must be produced by respiratory muscles can be modified by changing the distribution of VA and FA (= gain). 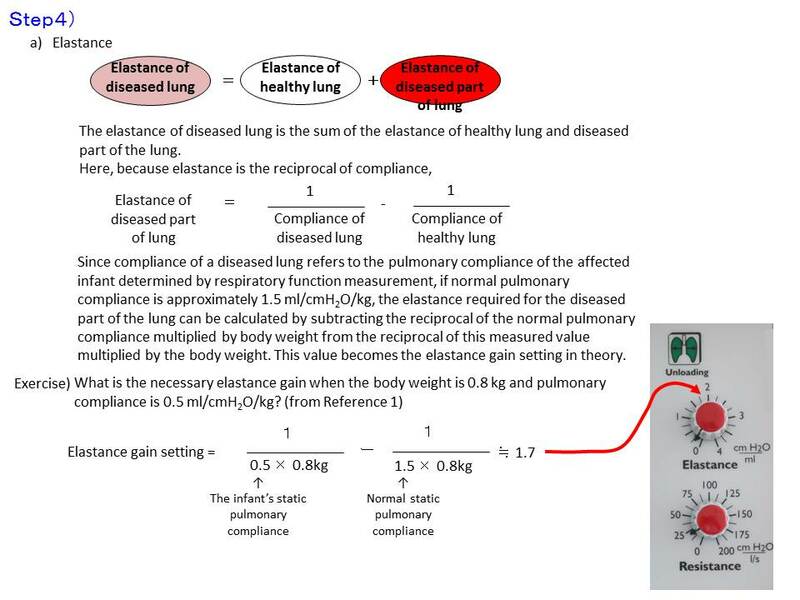 Since the elastance of diseased lung is the sum of the elastance of healthy lung and diseased part of the lung, the equation shown in the figure holds true. 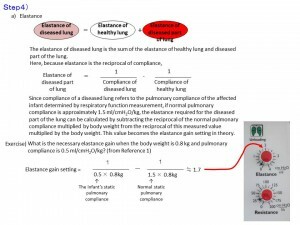 Here, since elastance is the reciprocal of compliance, elastance gain that should be assisted for the diseased part can be calculated from the affected infant’s pulmonary compliance that can be acquired through respiratory function measurement, normal pulmonary compliance, and body weight. 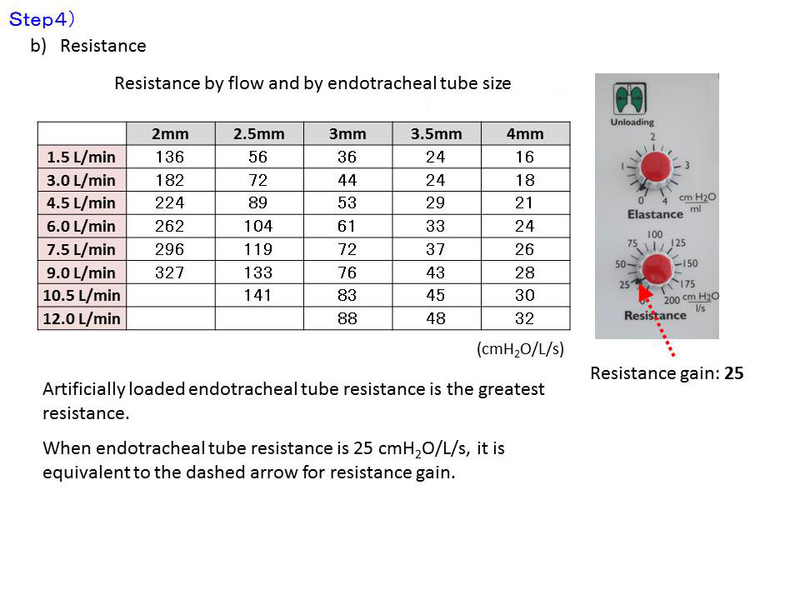 Regarding respiratory resistance, the greatest resistance is due to endotracheal tubes, and the resistance value changes depending on the endotracheal tube size as well as flow velocity. 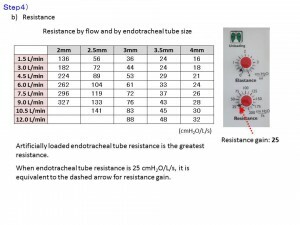 The thinner the tube, the greater the resistance value. However, since the tidal volume is smaller by that amount, with the exception of 2.0 mm, setting around 25 cmH2O/L/s is normally sufficient. These numbers are merely theoretical values, and for the actual setting, pressure waveform and blood gas values etc. are used as references. Apnoea cannot be resolved with PAV without backup ventilation alone. However, it can be used in preterm infants with Stephanie by utilizing the backup ventilation described below. When the gain is set too high for the infant’s lung condition, an abnormal pressure waveform called the “run-away” phenomenon may appear. 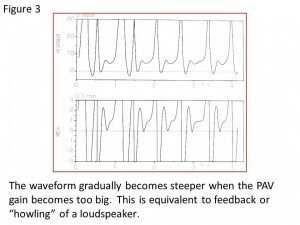 This is a phenomenon that occurs by further adding assistance to pressure created by PAV, and is equivalent to the “howling” feedback of loudspeakers. Attention is required when the pressure waveform starts to look pointed before a waveform shown in Figure 3 appears. Due to the mechanism of PAV, it is not suited for pathological conditions where the pulmonary compliance dramatically changes in a short period of time such as after pulmonary surfactant administration. 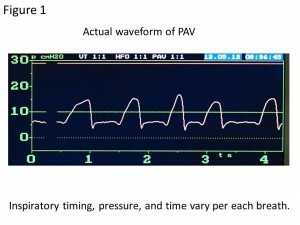 In PAV, the ventilation pressure and inspiratory time change according to the intensity of spontaneous respiration, and there are limit mechanisms for this. 3) LIMIT VOLUME setting: When LIMIT VOLUME is set from OPTION→PAV, the maximum volume during PAV can be set. When the basic ventilation mode is modified with the operating mode switch during PAV, PAV is released for safety. Therefore, it is necessary to press the PAV (Unloading) key again to continue PAV. 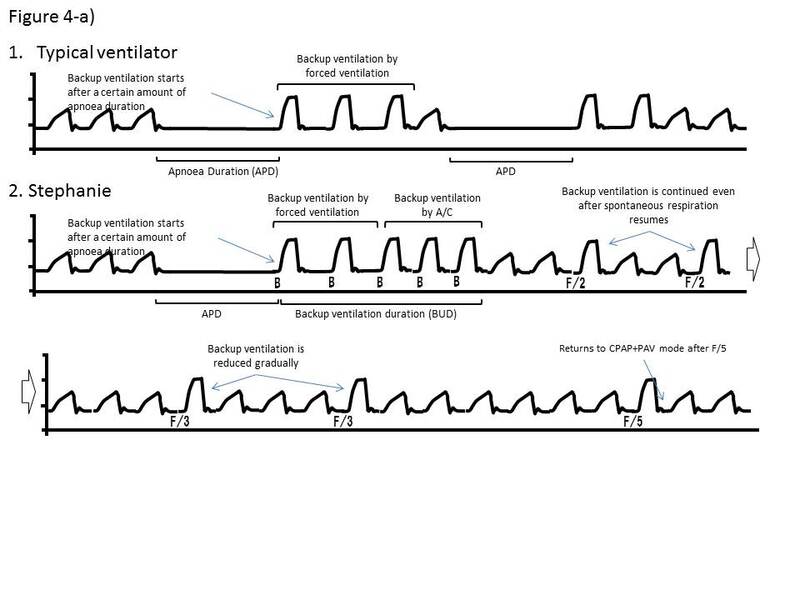 In general, after the preset apnoea duration has elapsed, backup during apnoea by the ventilator starts forced ventilation in the backup mode, releases or cancels the backup mode once spontaneous respiration reappears, and switches to the original spontaneous mode (i.e. PSV) (Figure 4-a 1.). This procedure is the same with Stephanie up to the step when it switches to the backup mode after a certain amount of apnoea duration (APD). 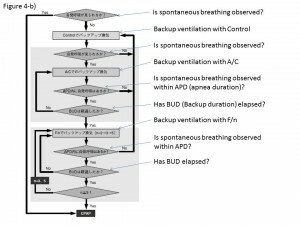 However, with Stephanie, after starting backup ventilation determined by the backup duration (BUD) setting, it switches to A/C once spontaneous respiration reappears, and the spontaneous mode is restored after BUD has passed. Furthermore, after spontaneous respiration appears, it does not simply switch to spontaneous mode: instead, it displays “F/2, F/3, F/5″ (with F as ventilation rate), and it returns to spontaneous mode after SIMV (for example, if the backup ventilation rate setting is 30 times/min, then F/2 = 15 times/min, F/3 = 10 times/min, F/5 = 6 times/min) for each rate is performed (Figure 4-a 2., Figure 4-b). In a typical ventilator, PSV and A/C are the spontaneous modes, but apnoea detection normally has common trigger sensitivity to these. This indicates that, if spontaneous detection sensitivity is made even more sensitive, there is a risk that a false trigger may indicate spontaneous respiration during apnoea. With Stephanie, spontaneous mode is PAV that does not require trigger sensitivity, and apnoea detection sensitivity is independent from the detection sensitivity of spontaneous respiration due to PAV. 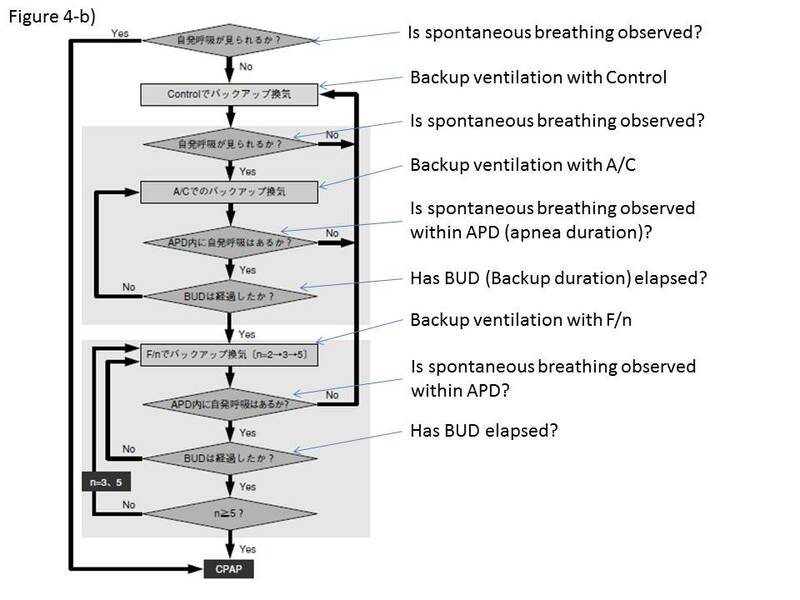 Therefore, it can be said that this is a ventilation mode that is compatible with apnoea backup ventilation. BUD must be set longer than APD. In Stephanie, spontaneous respiration is recognized both by trigger sensitivity and minimum VT (tidal volume). 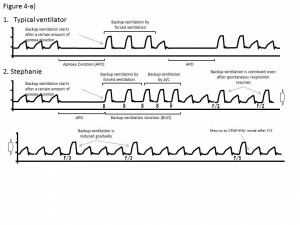 Although minimum VT is set to measure the number of spontaneous respiration cycles and for apnoea alarm, trigger sensitivity is used to recognize whether or not backup will be actually performed. For this reason, if trigger sensitivity is too sensitive, backup ventilation is less likely to take place. In preterm infants, SpO2 declines due to changes in respiratory state caused by various mechanisms, even during artificial respiratory management. 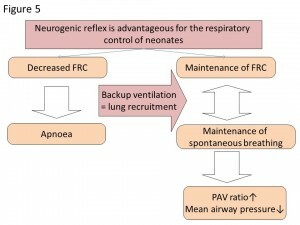 In particular, neural reflex regulation represented by the Hering–Breuer reflex is largely responsible for the maintenance of spontaneous respiration in preterm infants, and the maintenances of spontaneous respiration and functional residual capacity (FRC) are two sides of the same coin. In preterm infants, during apnoea accompanied by SpO2 decline, an appropriate lung recruitment assuming the decrease of FRC becomes necessary. On the other hand, because PAV has an effect to decrease mean airway pressure, the maintenance of FRC with appropriate lung recruitment leads to decreased mean airway pressure by increasing PAV ratio. Nonetheless, there are no clear guidelines for setting PAV and backup ventilation, and further assessments are needed in the future. With Stephanie, static pulmonary compliance can be measured by the occlusion method. For static pulmonary compliance measurement, there are two required conditions: 1) there are no tube leaks, and 2) there is no spontaneous respiration. 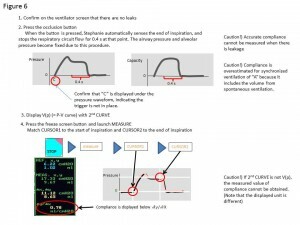 If the occlusion button is pressured at the point when positive-pressure ventilation without trigger begins (displayed as “C” underneath the pressure waveform), the end of the inspiration is automatically detected. Subsequently, the respiratory circuit is occluded for 0.4 s, and the airway pressure and alveolar pressure become fixed due to this. Next, press the freeze screen button, launch MEASURE from the Menu Key, and match CURSOR 1 & 2 to the beginning and end of inspiration, respectively, to display static pulmonary compliance measured below Δy/Δx in the lower part of the data area. To confirm that there are no leaks, it is necessary to display the volume in the 2nd CURVE on the graphic screen and to confirm that the volume waveform has returned to the baseline zero at the end of expiration. When “A” is displayed on the pressure waveform, the trigger is in place and the volume is overestimated. Thus, it is not suitable for pulmonary compliance measurement. Measurement value of static pulmonary compliance is displayed only when V(p) is second curve.